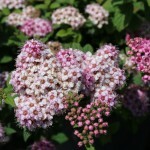 A dense, compact mound with bright green foliage and pink blooms throughout the summer. Attractive to butterflies. Foliage takes on an attractive reddish hue in fall. Heat, drought, and cold tolerant once established. 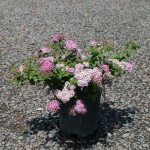 It prefers full sun and an average, well-drained soil. May be used in shrub borders, for mass plantings, or as an informal hedge.